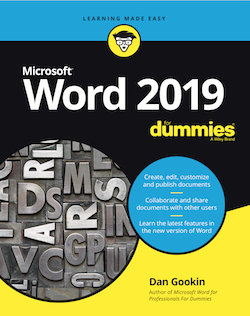 This page supports my books Microsoft Word 2019 For Dummies and Microsoft Word 2016 For Professionals For Dummies. 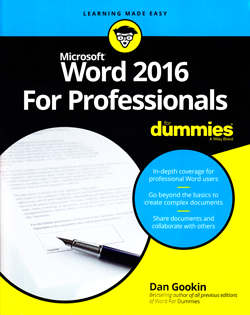 For support of my other Word books, click the proper link: Word 2016, Word 2013, Word 2010, Word 2007, and Word 2002/2003. I upload new Word Tip movies to YouTube all the time. Click here to visit my channel and learn something new in a fun and entertaining way. Watch! Like! Share! Subscribe! The shortcut for the en dash is Ctrl+(hyphen). The shortcut for the em dash is Ctrl+Alt+(hyphen), where the hyphen is the minus key on the numeric keypad. These items are listed incorrectly in the 11th and 13th bullets on the page. Figure 25-1 lists the macro's description as "first three letters" when it should be "first three words." This mistake occurs elsewhere, because it's what I wrote when I created the macro. In the code listing at the bottom of the page, the macro's description says "letters" instead of "words." Again, in the code listing at the bottom of the page, the description is incorrect. The Document Looks All Weird Trouble! Ever open a document in Word and it looks really weird on the screen? It's a Word document, but for some reason it got trashed! What did you do? What did you do? Read about what you did. For all Word-related blog posts, click here.